21" Aluminum Spray Gun Extension; 1/4" Hose Barb Inlet | 100 PSI | The 50800 TriggerJet spray gun is a lightweight spray gun designed for use with backpack, canister or other low-pressure sprayers. The TriggerJet is made of molded polypropylene. The 50800 TriggerJet spray gun is a lightweight spray gun designed for use with backpack, canister or other low-pressure sprayers. The TriggerJet is made of molded polypropylene for excellent chemical resistance and durability. 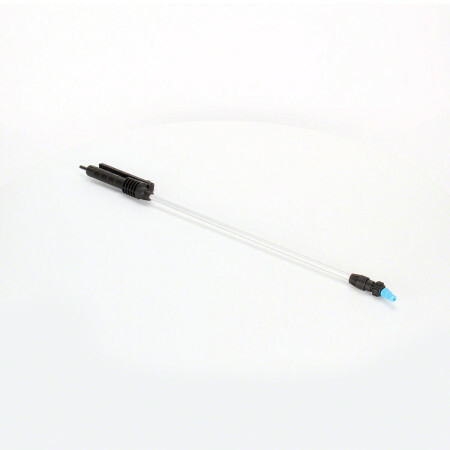 Available with 38720-PPB-X18 or X26 adjustable ConeJet tips with a 30° offset. Polypropylene strainer located inside handle to prevent tip clogging. Good replacement unit. Trigger pivot post is higher than original unit so makes a better engagement when opening the valve.